Hazel has arrived! July 7th I became a grandmother for the third time. I have two incredible grandsons and, now, I have a grand daughter. This quilt is for her. I originally made the blocks years ago and had no set plan for them. When I found out in December that my son and his wife were having a baby, I knew these blocks, this quilt was meant for Hazel. Completely scrappy, filled with fussy cuts and all the colors of the rainbow. Perfect for little eyes to discover hearts, keys, bowling pins and all sorts of other treasures. It is a quilt to create stories with and dream beautiful dreams under. The quilting is a simple crosshatch. The people of the house usually have no opinion whatsoever of any of my sewing, until now. The teenaged girl piped up with, "Mom, with the quilting, don't go crazy, it needs to be simple and soft." It is simple and soft. The boys in the house helped out with quilting a couple of lines. It is quilted using Aurifil 50wt in a lovely neutral to melt into the quilt. The binding was another cause for debate. I have been sewing completely from my stash for the past few months. The rules were it had to look amazing and I had to have enough of the fabric to make enough binding! It took about two hours ( possibly more) and three very opinionated people to finally decide on this sweet Robert Kaufman print! It is perfect! The dark purple is a great base and there are many of the bright colors in the fabric that compliment the bright colors in the blocks. When three stubborn people all say yes, you know it will be a winner! The other opinion that was given was that I should machine bind the quilt. I was debating hand binding because it looks so awesome. I am also a perfectionist when hand binding, wanting none of the stitches showing. I am very good at this skill but Hazel might be in college when I finished. Katy put her foot down and insisted that it be bound by machine! She also convinced her brother to chime in on the matter as well. I ended up agreeing and was able to finish the binding early this afternoon. I used a stunning 50wt purple for the front and used the same neutral for the quilting in the bobbin. It looks fantastic! I am so thrilled to welcome a new little bundle of joy into the family! Welcome to the world Hazel! We love you! What a perfect quilt for that perfect little girl! And how special that everyone in the family put in their two cents on design decisions! Hazel was my grandmother's name. Nice to know it's still being used for sweet little girls. 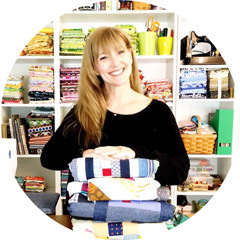 What a great story for this quilt - all of the family pitching in to design and finish it! Congrats on a new bundle of joy! Such a beautiful quilt for a sweet new addition. And I would never have thought of the purple but it perfect! Congratulations to you all and welcome Hazel! Beautiful quilt for Hazel. Love the purple binding! Hazel is a lucky girl! Congrats on the sweet new grandbaby! Love your beautiful quilt! What a stunning quilt for your precious granddaughter! Your family is right... it is beautiful and special!! Now I have a quilt like this on my "to do "list!! First of all congratulations on your new granddaughter! 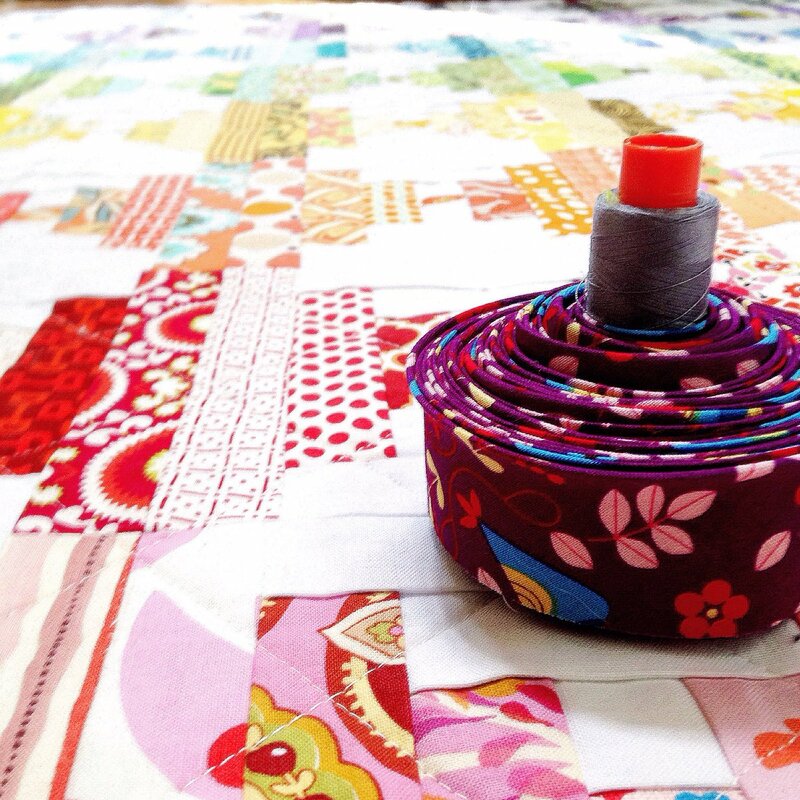 The rainbow scrap quilt is beautiful and will be a treasure for many years to come! Congrats and a big welcome to little Hazel. Her quilt is amazing!!! I love it. Sometimes I like input on my quilts and sometimes not so much. LOL The finished quilt is perfect so I think you had good advice. Enjoy that baby. I love the fact that so many family members had input into the quilt in one way or another, what a lovely project! Such a pretty, scrappy quilt! Love, love! I love this quilt. Lucky grand daughter.